Just A Car Guy: the last Stinson A Trimotor in existence was protected from a wildfire in 1968. 1 of 32 built. It crashed in 1947 and for years unsuccessful attempts had been made to get it out of the tundra. 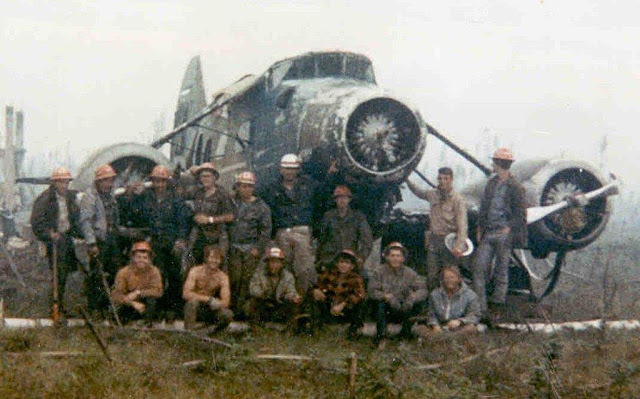 the last Stinson A Trimotor in existence was protected from a wildfire in 1968. 1 of 32 built. It crashed in 1947 and for years unsuccessful attempts had been made to get it out of the tundra. A BLM official was looking for a crew to volunteer to save the only remaining example of an old Stinson A Trimotor supposedly for the Smithsonian Institute. The aircraft was in the path of a massive fire. It was 1968 and these guys may have wanted to fight wildfires, or, avoid the draft. Either way, they were in the vast tundra of Alaska having bugged out of their previous jobs in Glacier National Park in Montana. in 1964 J.D. “Red” Berry acquired rights to the plane that had crash-landed in 1947 and spent the next eight years getting it out of the tundra. The aircraft was then purchased by Eugene Coppock in 1970, who spent from 1972 until 1979 rebuilding the Trimotor and finally flew it for the first time in July of 1979. The Alaska Aviation Heritage Museum purchased the Trimotor in 1988 and considered it the jewel of their impressive collection. Greg Herrick, a private collector, then purchased and had the aircraft restored in 1998 (click here for an article detailing that restoration) and it is currently housed in Minnesota.